It starts on Sunday - I do believe that's the 1st December. What an opportune time to start an advent quiz. More details coming soon ..... stay tuned to this thread. Christmas is coming, as it is so often wont to do. Let's see if I can get a single question right this year! I'm feeling confident! (IE: I've got no chance) But at least this time, I'll make a guess at every question I attempt. That's the spirit Dino & Steve! There's more Who questions this year (well it is a special anniversary!) Plus there are prizes for 1st, 2nd & 3rd places, so there's everything to play for! I'm warming my brain up ready. Still recovering from a fiendish DW quiz last weekend! There are prizes for 1st, 2nd & 3rd places, so there's everything to play for! a whopping £20 in Amazon vouchers. If you don't spend it on Who goodies, I'll send Davros round. 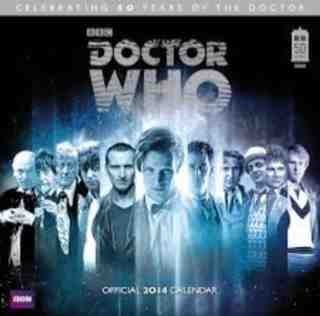 The Official BBC Who Calendar 2014 - it's got all the Docs on this one. If you're thinking of buying it, no need - you can win it here! I'm aiming high...I'm going for the 3rd prize! You are competing against each other, which is why it would be a bit foolish to put your answers where all can see! But feel free to post as many red herrings as you like! Answers to the questions (including a selection of delightfully duff responses) will be posted the day after the question. I shall try to post as early as I can to give you as much time to answer. Answers to all weekend questions (Saturday and Sunday) will be posted Monday. With me so far?? All the other days are "bonus" days with lots of points up for grabs, so it would be unfair to allow jokers on those days. You can either publicly announce when you're playing the jokers (i.e. on this thread) or you can sneakily do it in secret (via Private Message to me). I will announce when a Sneaky Secret joker has been played, but not who by. Otherwise it wouldn't be a sneaky secret. Are you SURE you're still with me? But suppose I meet my future selves who persuade me that it would be better for me to not not play my joker but to play it when I didn't wouldn't have done ? Lol indeed :-) As with most quizzes and games, it's far simpler just to start playing! The fun / torment* starts tomorrow. I'd like to play my Jokers on 24th, 16th and the 8th. For all the good it'll do! So here we are - Happy December! No-one's playing their Joker for this first question, so we'll plough straight in. And we kick things off with a Who-related sound clip. If you're having trouble accessing SoundCloud then PM me your email address and I'll send it to you that way. For 1 point - name the story! Don't forget - PM me your answer - not on the thread! Oh my goodness, it's started already!